Before the season begins there’s two lists that seem to cause a stir within the hockey community: the Top 50 Players in the NHL. The Hockey News puts out one in its annual season preview yearbook while TSN has an entire hour-long broadcast dedicated to it. Both lists are compiled in the same way (which is why they tend to be similar), and that’s via a poll of people inside hockey. That may be where some of the controversy lies. It’s not necessarily that those guys are wrong about who’s the best of the best – it’s their job after all – it’s that their opinions tend to be moulded by a few biases that cloud their judgement. From looking at the list every year (and how it changes) it’s shaped a lot by recency bias, reputation and a winning pedigree. I wanted a different take on the debate so I enlisted some of hockey’s top nerds doing work in the public sphere to share their opinions of who they think will be among the 50 best players in the league in this upcoming season. This is not meant to disparage the lists compiled from insider views, but sometimes it’s valuable to get an outsider’s perspective. The people inside hockey are generally going to prefer the ol’ eye-test for player evaluations, so getting some number-crunchers instead provides a different insight into the best that hockey has to offer. 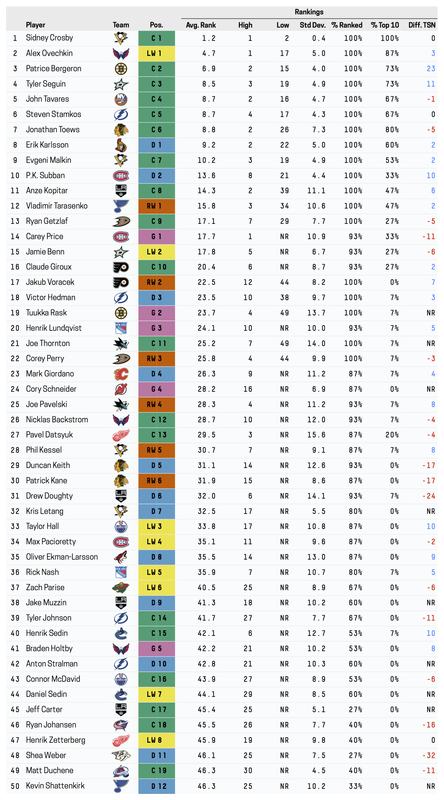 Most of them complained about it while a few called rankings a rubbish exercise altogether, but somehow I managed to get 15 different lists from 14 very talented stats-oriented hockey analysts plus myself to create the first (annual?) Hockey Graphs Top 50. The most interesting part of gathering the individual lists is seeing just how differently everyone saw the NHL’s elite. From 15 different lists, 116 unique players emerged. Here’s who made the Top 50. Here’s some observations from the list. Sidney Crosby was a strong consensus number one. While TSN’s list had just 44 percent of respondents putting Crosby at No. 1, the HG panel had 80 percent. Just look at his average rank and the rest of the top 10. It’s not close. Ovechkin is still second to Sid which is a jump from TSN’s ranking. Ovechkin was the only non-Crosby player to appear in the top five more than half of the time. He was there on 13 of 15 lists. Aside from the players who were unranked, Patrice Bergeron gets the largest increase from TSN’s rankings. In case you were wondering, yes Bergeron might still be very underrated for what he does. His former teammate, Tyler Seguin, gets the next biggest jump. Bergeron naturally gets compared to Jonathan Toews often, and opinions were very much split between them. Eight of the 15 lists had Bergeron higher than Toews with Bergeron getting the overall edge in average rank. The biggest drop from TSN’s top five belongs to Carey Price. He’s still the top goalie here, but with the uncertainty involved in the position the panel was much more lukewarm on his overall ranking. What was interesting to me is that eight of 15 lists had Carey Price lower than P.K. Subban. The only goalie to appear on every single list was Tuukka Rask who ends up five spots lower than Price, but was left off TSN’s list altogether. One panelist had him in the top five. Goalies in general had the largest variation in rankings which is not a surprise considering the whole “goalies are voodoo” mantra that’s spouted often by the stats crowd. The average standard deviation (on lists where they were actually ranked I must add) for centers was 7.7 rankings spots which was the lowest. Goalies were highest at 10.3 spots. Each of the top four goalies received one vote for best in the league. How many top 10 players are there in the NHL? 29 according to the 15-member panel. There were 17 different players voted for the top five which shows how little consensus there can be even among people with very similar values. That’s something worth thinking about with the insider lists too, because personal biases vary greatly. The lowest ranked top 10 player is Henrik Sedin who comes in at No. 40, while Datsyuk is the lowest ranked top five player at No. 27. Perhaps even crazier is that just 18 players made it onto every single list. In case you were wondering how much the voters cared about #ringz some of the biggest drops come from three guys on the two most recent Cup champions: Kane, Keith and Doughty. Reputation and winning pedigree both apply here as all three have seen their underlying numbers slip a bit in recent seasons. The largest drop, though, belongs to Shea Weber who has become a personal battleground between the spreadsheet warriors and the eye-test bandits. He only appeared on four of the 15 lists and ends up behind Corsi darlings Jake Muzzin and Anton Stralman. I’m sure that won’t be controversial. More than half of the panel thought Logan Couture deserved to be in the top 50, but he ends up at No. 58 thanks to many people getting stuck at No. 46, sighing, and then saying “Logan Couture? I guess?” Six of his eight votes had him 42nd or worse. 35 players got a single vote from a panelist and no one else. I call these players pets as they were someone that the list-maker loved much more than anybody else. The highest rated one was Derek Stepan who was No. 20 on one list, but unranked on all others. Here’s the guys we left off in order of where they’re ranked with TSN’s ranking in parenthesis: 54: Brent Burns (45), 56: Logan Couture (48), 60: Marian Hossa (46), 66: Ryan Suter (34). 80: Alex Pietrangelo (39), 84: Ryan McDonagh (42), 92: Pekka Rinne (29), 93: Roman Josi (40). There was just one player who made TSN’s top 50 that didn’t receive a single vote of recommendation from our panel. You can take a … quick guess at who that was. I am not sure what others thought, but settling on a top 50 is a really difficult thing to do. I could have shuffled players for days and never been completely satisfied. With that said, man, are we ever messed up. Someone ranked Carey Price the best NHL player while at least one other person didn’t think he deserved to be in the top 50. I personally can’t fathom how someone can not think Henrik Sedin or Jamie Benn or Pavel Datsuk are not top 50 players. Amazing how peoples opinions can differ so much. I don’t think it’s too hard to have goalies all over the map, because there’s a dual valuation at work: valuation of player, valuation of goalies. Other players, hard to say, because people weight recent performance differently. Some do a 3:2:1 like the Tango suggestion, others do 2:1, others do 1:1:1:1 etc. back to their first season. Certainly we all have different criteria and I am certain a lot of people would dispute where I ranked players. I mostly focused on 3-year numbers and I certainly biased my rankings more towards centers than wingers. I think defensemen are difficult to rank as well and figuring where to slot them in with forwards was also difficult. In the end I think the final crowd-sourced list ended up pretty good. Can’t believe that Carey Price was left off at least one of the respondents’ lists. It tells me that even in the advanced stats crowd, there’s a lot of bias going around. IMO, anyone who left Price off the list has lost all credibility. In this context, you’re kinda hoping somebody chases you down the “bias” rabbit-hole. The truth is, he’s up there, he’s rated highly – tops among goaltenders – and your bias is saying somebody else’s bias is wrong. All good reasons to focus on consensus, rather than singling out biases and beliefs. The only goalie to make every ballot was Rask who had a 49th vote. Someone doesn’t value goaltending highly, likely due to the fairly bad stats we have for them.